If you interfere in a prohibited way with a police officer’s ability or attempt to conduct their duties in New Jersey, you might be charged with obstructing the administration of law. This offense is also commonly referred to as “obstruction of justice.” A conviction for an obstruction offense in violation of N.J.S.A. 2C:29-1 will create a criminal record and can lead to fines and even jail time. Depending on the circumstances, you may be charged with a disorderly persons or fourth degree indictable offense for obstructing the law. If you have been charged with obstruction, the criminal defense attorneys at our Burlington County criminal defense law firm are here to help. 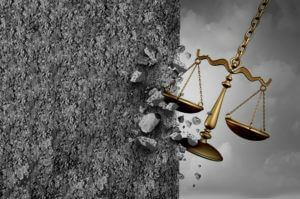 Our lawyers have extensive experience defending those accused of obstructing justice and we can assist you immediately with charges in Mount Laurel, Mount Holly, Cinnaminson, Bordentown, Delran, Florence, Evesham Twp and areas in and around Burlington County, NJ. Please feel free to contact our local law office at 609-832-3202 to discuss your case. We provide consultations at no cost to you. New Jersey Law prohibits “Obstructing administration of law or other governmental function” in section 2C:29-1. In order to be convicted of this offense, the prosecutor must prove beyond a reasonable doubt that you purposefully obstructed, impaired, or perverted the administration of law or a government function or tried to stop a public servant from performing their job duties through violence, force, physical interference, flight, or any other independent unlawful act. If is important to note that not every action that happens to interfere with a police officer’s ability to conduct their job constitutes obstruction of the administration of law. The act must be independently unlawful. Any evidence that you tried to run away from police, threatened the police with physical violence or took any affirmative step to purposely interfere with an officer’s ability to carry out their job duties will be used against you by the prosecution. However, courts have ruled that mere words from a defendant are not enough to constitute interference. Evidence that indicates that your interference was not purposeful, but rather accidental, should be emphasized by your defense lawyer. In New Jersey, obstructing justice is usually charged as a disorderly persons offense and is heard by a municipal judge in the municipal court of the town or city where you were arrested. If you are convicted of this disorderly persons offense, you may face up to 6 months in jail and be ordered to pay up to $1,000 in fines. Obstruction can also be charged as a fourth degree indictable offense if you obstruct the investigation or detection of a crime or a prosecution. Fourth degree obstruction of the administration of law charges are heard in Superior Court in the county where you were arrested. If convicted, you may be sentenced to up to 18 months of imprisonment and up to $10,000 in fines. Whether you are eligible to have an obstruction of justice conviction expunged depends whether you have had an expungement in the past. You are not entitled to more than one expungement in your lifetime. Also, it depends on whether you have other charges on your criminal record and whether they were indictable or disorderly persons offenses. If you were convicted of fourth degree obstructing the administration of law, you may be eligible to expunge the offense after a six-year waiting period. You will also be subject to a wait time of 5 years for a disorderly persons conviction for obstruction in New Jersey. If the charges against you were dismissed outright, you can apply to have the record of your obstructing justice arrest expunged immediately. If you have been charged with obstruction of the administration of law in New Jersey, it is important to seek the counsel of an experienced criminal defense lawyer who can explain the charges and walk you through the legal process while looking out for your best interests. With the possibility of serious consequences hanging over your head, you should have a lawyer review your case, determine what defenses may be available to you, and try to get the charges against you dismissed. Call our law office serving Burlington County, Gloucester County, Camden County, and across South Jersey today at 609-832-3202 for a free consultation.